Photo courtesy of West Wyalong Girral Bulldogs. West Wyalong Recreation Reserve was the venue for a crackerjack Grand Final in 2011 between Lake Cargelligo Tigers and the Barellan Two Blues. “It turned out to be one of the closest and most exciting grand finals for many years, which had the largest ever crowd enthralled right to the end,” reports Paula Rees, former West Wyalong Girral Bulldogs secretary. The boys in the photo are Rowan, Kieran and Liam Duncan. Their parents Barry and Belinda Duncan have run the local West Wyalong Auskick for the last few years with Barry a past football player and Belinda a past netball player. Belinda was also secretary of the club from 2001 to 2006. 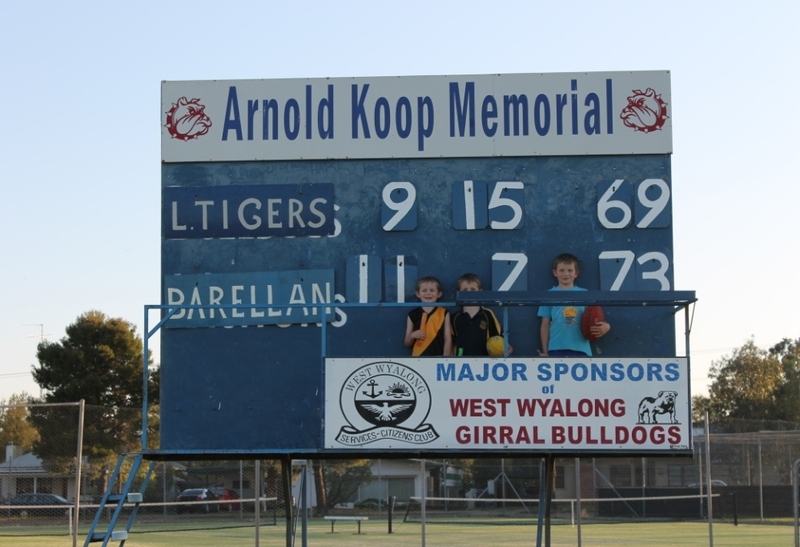 The scoreboard at West Wyalong is named after the late Arnold Koop, a life member whose roles included president, secretary and, yes, scoreboard attendant.